God Bless you Chad......Great Officer and friend. May God comfort your family......You are missed! Detective Parque, may you Rest In Peace our brother. You will never be forgotten. My family and I would like to extend our condolences to the family, friends, and fellow co-workers of Detective Chad Parque during this very difficult time. May the moments shared in the past bring forth happy memories to last a lifetime. May they find comfort and support from those around them. May God help heal your aching hearts. Thank you for you service and may you rest in peace Detective Parque. Godspeed the peace to your family and friends! "Well done good and faithful servant" May he rest in peace in the arms of the loving God. The National Police Wives Association would like to extend their heartfelt prayers to the family of Detective Parque and the North Las Vegas Police Department during this time. Thank you, Detective Parque, for your service. Sending my sincere thoughts and prayers to your family, friends and department. I am so very sorry for the loss of your HERO. May God give you comfort and peace during this difficult time. Rest in Peace Detective Parque. May the Lord grant your family, friends and co-workers peace during this difficult time. We offer our deepest sympathy to the co-workers, family and friends who are grieving the loss of Detective Parque. May the Grace of God be your strength in the days ahead. Rest in peace brother. Thoughts are with your family both blue and blood during this difficult time. Thank you Detective Parque for your 10 years of service and dedication to your community. I called you "partner" for many years. Called you friend for even more. The most important one though was "Brother". It was definitely my honor. It was awesome to work beside you, share a patrol car with you, and be a part of each other's families. I will hold these memories forever close to my heart. My daughters and family are crushed over losing their favorite "Uncle". I hope you rest in piece brother. The thin blue line just got thinner. The world a little darker without you. May you rest in piece and may God comfort and protect your family. Thank you for your service Det. Parque. Praying for your family, friends and colleagues during this time of sorrow and celebration of your life. Rest in peace, Detective Parque. You deserve your divine reward. 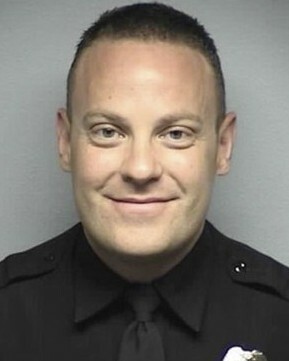 My deepest condolences to the family of Officer Chad Parque, a good man lost too soon.